Jebel Akhdar War (Arabic: حرب الجبل الأخضر Harb al-Jebel el-Akhdar) or Jebel Akhdar rebellion erupted in 1954 and again in 1957 in Oman, as an effort by Imam Ghalib bin Ali Al Hinai to protect the Imamate of Oman lands from the Sultan Said bin Taimur. The war continued until 1959, when British armed forces were involved in aiding the Sultan and winning the war. During the late 19th century and early 20th century, the Sultan in Muscat faced encroaching forces of the Imam of Oman proper, centered on the town of Nizwa. This conflict was resolved temporarily in 1920 by the Treaty of Seeb, which granted the Imam an autonomous rule in the interior Imamate of Oman, while recognising the nominal sovereignty of the Sultan of Muscat. When oil exploration had begun in Oman in the early 1920s, by the Anglo-Persian Oil Company, oil was found in the region of Farhud, which was part of the Imamate lands, prompting the Sultan to violate the Treaty of Seeb and take over the Imamate lands. The Army was still unable to deal with Talib's stronghold. The few paths up the Jebel Akhdar were far too narrow to deploy attacking battalions or even companies. One attempt was made against the southern face of the Jebel, using four infantry companies (including two companies from the Trucial Oman Scouts, from what would later become the United Arab Emirates). The attackers withdrew hastily after concluding they were vulnerable to being ambushed and cut off. In another attempt, infantry launched a feint and then withdrew while Avro Shackleton bombers of the RAF bombarded the supposedly massed defenders. They inflicted no casualties. For two years, rebel infiltrators continually mined the roads around the Jebel, and ambushed SAF and British detachments and oil company vehicles. The SAF were spread in small detachments in the towns and villages at the foot of the Jebel, and thus vulnerable and on the defensive. Their arms (mainly British weapons of World War II vintage) were less effective than the up-to-date equipment used by Talib's fighters. A SAF artillery unit with two 5.5 inch medium guns harassed the settlements on the plateau on top of the Jebel Akhdar, to little effect. Despite the defeat, some insurgents continued to cross into Oman from Saudi Arabia or via the UAE, and laid landmines which continued to cause casualties to SAF units and civilian vehicles. The SAF lacked the numbers to prevent this infiltration. A paramilitary force, the Oman Gendarmerie was formed in 1960 to assist the SAF in this task, and also to take over normal policing duties. The landmine campaign eventually dwindled away. 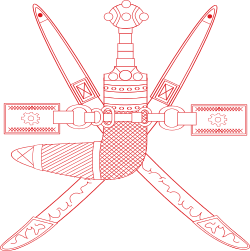 1 2 3 The Jebel Akhdar War Oman 1954–1959. Globalsecurity.org. Retrieved on 2012-04-12. ↑ Mike Ryan (2 May 2003). Secret Operations of the Sas. Zenith Imprint. pp. 189–. ISBN 978-0-7603-1414-2. Retrieved 12 April 2012. ↑ "Overview". Omani Ministry of Information. ↑ Townsend, John (1977). Oman: The Making of a Modern State. New York: Croom Helm. p. 64. ISBN 9780856644467. ↑ "Background Note: Oman". U.S Department of State – Diplomacy in Action.